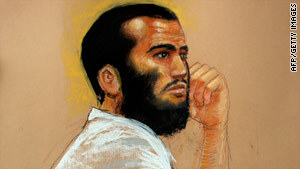 A sketch by courtroom artist Janet Hamlin shows Canadian defendant Omar Khadr on April 28. Guantanamo Bay, Cuba (CNN) -- Final preparations were underway Sunday for what will be the Obama administration's first full military commission hearing, set to begin this week. A few hours after an 8 a.m. recording of the national anthem that blared across Guantanamo's Camp Justice, attorneys for the Military Commission -- both prosecutors and defense attorneys -- met with judges to plot out the procedures and schedules of what could play out in the courtroom this week. Canadian citizen Omar Khadr, the youngest detainee in the U.S. facility at Guantanamo Bay, was captured on the battlefield in Afghanistan in 2002 when he was only 15. Now 23, he is set to go on trial, charged with terrorist acts for al Qaeda and the killing of a U.S. Special Forces soldier. His Pentagon-appointed lawyer, Lt. Col. Jon Jackson, tried and failed to have the trial stopped -- the Supreme Court denied his request Friday. Monday will be devoted to dealing with motions, Jackson said, predicting the panel of 15 members of the U.S. military that will act as a jury will be seated by the end of the day on Tuesday. The government said late Sunday it expected the commission trial to begin on schedule, and that it could last as long as four weeks. Navy Capt. David Iglesias, a former federal prosecutor and also part of the Navy's Judge Advocate General's Corps, said if Khadr is convicted of serious charges, "the government will ask for life" in prison. When the case begins, the Canadian branch of Amnesty International will be inside the courtroom. Alex Neve, Secretary General of Amnesty International Canada, ripped into both the U.S. and Canadian governments for not halting the terrorism trial. "Amnesty International has been a strong critic of the Military Commission process, really from day one. And even the various improvements and changes that have been made over the years have not, in our view, turned this into what can be considered a legal process that meets international fair trial standards," Neve told CNN Sunday. Although the U.S. military has allowed Neve to visit the base and to attend the trial, he won't be able to participate or to speak with Khadr. Neve said the Canadian government had been unwilling to speak out against the United States or to insist that Khadr be tried in Canada or regular U.S. courts. "The Canadian government with breathtaking defiance has refused ... to lift a single finger to ensure that something is done to protect his rights," he said. Canada's top court ruled in January that Khadr's rights were violated when Canadian spies interrogated the Toronto-born man and shared information with his U.S. prosecutors, according to the Toronto Star newspaper. Canadian Justice Minister Rob Nicholson sent a diplomatic note in response to the ruling, seeking the Obama administration's assurances that information from Canada would not be used at Khadr's trial, the newspaper reported. Washington responded in May that it would leave it up to Guantanamo's military judge to decide what evidence to admit, the Star said. Foreign Affairs spokesman Alain Cacchione told the Star the Canadian government has "complied" with the court ruling by delivering the note. "Canada recognizes the independence of the U.S. criminal proceedings," he said in May. "We are not going to give up at all," Neve said. "We have been speaking out about Omar Khadr's situation and demanding that his rights be protected for eight years now and we will continue for as long as it takes." Defense attorney Jackson said he didn't know whether his client would be in court on Monday. "If Omar is coming (to court), I will know it in the morning," Jackson said Sunday. "I don't know right now." He said he had no indication the judge would force Khadr to come to court. Jackson said he would work vigorously to defend Khadr. "Be sure of this, if Omar Khadr gives me the opportunity to represent him and I will be the only lawyer there for the defense, I'm going to do everything in my power to represent him zealously, ethically and I would not be a toady of the government. I'm there to work with this kid," Jackson said, adding that it was wrong for the United States to prosecute a then-15-year-old child solider. But prosecutor Iglesias rejected criticism from the Khadr defense team that since Khadr was only 15 at the time of his capture he should not be placed on trial. "It is legally irrelevant," Iglesias said at a news conference, referring to Khadr's age. Iglesias said the case depends instead on whether Khadr knew what he was doing. "He was 15, he wasn't nine or 10," he said. Meanwhile, a civilian lawyer who has been working with terrorism suspect Khadr said late Sunday that the judge had refused to postpone the proceedings for the Muslin holy month of Ramadan. The Muslim calendar sets out a month for prayer and fasting during daylight hours and is expected to start this year on Wednesday. Dennis Edney, a lawyer from Edmonton, Canada, said the judge had refused the postponement motion earlier Sunday. Edney said going without food for 14 hours a day would impede Khadr's ability to follow complicated charges and testimony. "This hearing is an unfair process. This is a horrible process ... a disgrace in any language," Edney told reporters at Guantanamo. He said he hoped Khadr would appear in court and "tell the world what a hellish place this (Guantanamo Bay) is and how he has been abused." Edney described Khadr as a gentle young man, adding, "I think he's fearful. I think it is intimidating." The Pentagon provided a chartered jet for 32 journalists -- many of them representing news outlets from Canada, where interest in the case is high -- to Guantanamo on Saturday. Journalists were seated in the back of the plane, which also carried lawyers, witnesses and representatives of Amnesty International and other human rights organizations. Journalists signed lengthy agreements not to photograph or record the proceedings. They are housed in a sprawling array of air-conditioned Army tents along an abandoned runway just steps from where the military commission will be held. But journalists are severely restricted in what they can see and do and must even be accompanied to meals by military public affairs officials. In addition to the Khadr trial, a separate military commission on Monday morning will deliberate the sentence for the Sudanese man the U.S. says was Osama bin Laden's driver, Ibrahim Ahmed Mahmoud al Qosi. This will be the first chance to learn details of al Qosi's earlier plea agreement. His sentence is expected to be far less than the life sentence he was facing and could mean he is returning home to Sudan.